Less Than Half Of HIV/AIDS Stories Featured Expert Commentary. 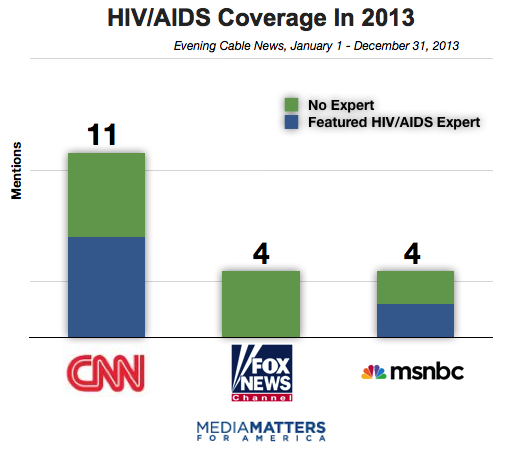 Of the 19 discussions of HIV/AIDS on cable evening news during 2013, less than half featured commentary from an expert on HIV/AIDS. 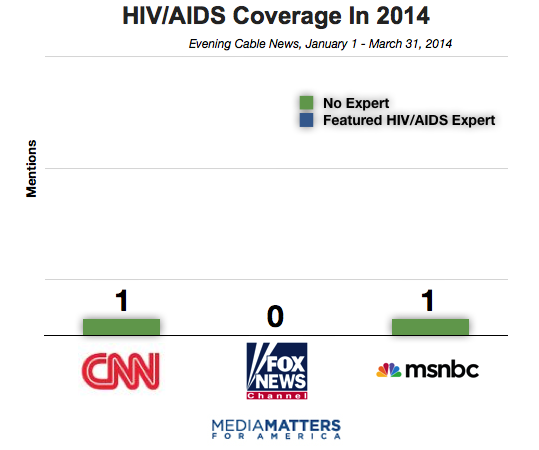 Cable News Coverage Ignored Major HIV/AIDS Developments. Aside from six mentions of the baby whose HIV was in remission due to early antiretroviral drug treatment, evening cable news shows largely ignored significant developments in the fight against HIV/AIDS. Other mentions of HIV/AIDS included interviews with Magic Johnson, acknowledgments of World AIDS Day, and discussions of President George W. Bush's international AIDS work. Media Matters searched news transcripts on Nexis between January 1, 2013 and March 31, 2014, using the search term "allcaps(HIV) or allcaps (AIDS)" during CNN, MSNBC, and Fox News' weekday evening news broadcasts. All segments that focused on stories involving HIV/AIDS prevention, treatment, research, and history were included. Crime stories involving HIV/AIDS, including the story of a man who was accused of knowingly infecting partners with HIV, were excluded. Passing mentions, teases for upcoming segments, and reruns were excluded. Evening cable news shows included in the study: The Situation Room, Erin Burnett OutFront, Anderson Cooper 360, Piers Morgan Tonight, CNN Tonight, The Five, Special Report with Bret Baier, On The Record with Greta Van Susteren, The O'Reilly Factor, The Kelly File, Hannity, The Ed Show, Politics Nation, Hardball with Chris Matthews, All In with Chris Hayes, The Rachel Maddow Show, and The Last Word with Lawrence O'Donnell. For the purposes of the study, guests who were medical professionals, activists, or organizational leaders specializing in HIV/AIDS were considered "experts."